Under the slogan "KillSwitch: make your breaks stink less," comes an application that will make things very easy for all those who spend the Valentine cursing his former partners. KillSwitch is an invention that will be released in the next few hours in the App Store and Google Play and serves to remove all traces of your ex on Facebook. This, of course, still have to be friends in the social network. 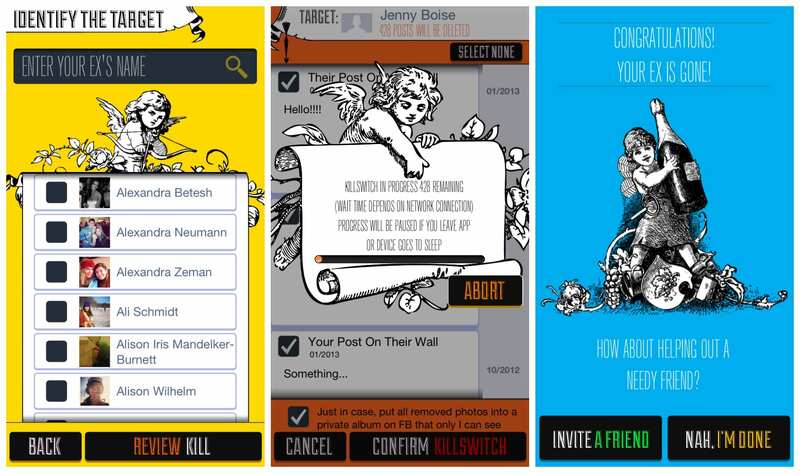 'KillSwitch' will show a list of all the names of your friends on Facebook: simply select the name of your ex-partner for the application to handle delete, automatically, every interaction you had with that person in the social network. If instead you prefer to hide all your interactions in a "secret folder" app, so you can do to recover 'those moments' as you please review and, perhaps, laugh at them. A curious idea, no doubt, even to avoid falling in the past during the Valentine. "Can we really delve straight into a new relationship when others are still remaining in our digital lives?". This is the idea posed KillSwitch makers from their official website. Article removes all traces of your ex on Facebook with this application was originally published in News iPhone .